Oh how I wish authors (then and now) would get it into their heads that having three names makes for confusion on the part of the reading public – namely me. Except for Arthur Conan Doyle and Edgar Allan Poe and maybe one or two others, it’s always best to simplify. Two names were good enough for the likes of Jane Austen and Rex Stout and for goodness’ sake, William Shakespeare. Simplify. Simplify. Otherwise risk being forgotten or confused in the stacks with someone else or forever having to be looked up since most three name appellations do not slip easily off the tongue or lodge comfortably in memory. 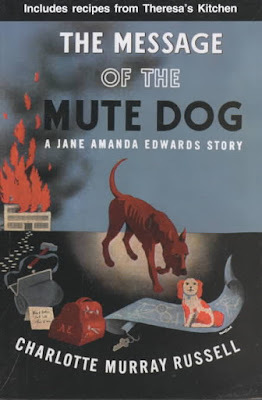 In THE MESSAGE OF THE MUTE DOG, a pleasant if slightly long-winded whodunit set during WWII (raging in Europe) we are introduced to the usual coterie of small town America types, among whose ranks lurks a murderer and saboteur. In fact, if not for the cunningly suspicious mind of busybody spinster detective, Jane Amanda Edwards (three names! ), all might have been lost and the blueprint for a newfangled military widget handed over to the Nazis. Jane Amanda Edwards is your typically officious, eccentric type – a shrewd middle-aged spinster burdened with a brother and sister of the sort perpetually stumbling into trouble and interfering with Jane's detecting activities. Brother Albert is actually a fun character – totally idiotic, but engaging in the sort of bumptious way that old character actors in movies of that era often were. (He reminds me of the loony-toony trumpet playing brother in ARSENIC AND OLD LACE). The sister, Annie, is exasperating but what the heck, she’s Jane Amanda Edwards’ burden. I could see a Billie Burke type in a movie version which might give flibbertigibbet Annie an added charm missing from the book character. But don’t get me started on Theresa, the disagreeable Edwards family cook. Jeez. The only reason anyone puts up with her is because she is such a darned fine cook. (There are recipes in the book.) I’ve discovered that in the good old days of mystery, cooks often got away with all sorts of obnoxiousness because of their culinary skills. Yeah, I guess a good cook is a good cook and lots will be forgiven in pursuit of a happy stomach. Jane and her family are basically caricatures but so vividly sketched by the author that it’s very easy to visualize them, and fortunately their antics and much of the dialogue is amusing when not downright funny. These are people that in real life would drive you batty, but in a whodunit of this type, they are welcome and comfortably familiar. When the owner of the local manufacturing plant (involved in the war effort) is killed in his office and a fire started to try and cover up the crime, it’s up to Jane Amanda Edwards to step in and solve the mystery most especially since the local constabulary is hapless and clueless against suspected saboteur activity. As she appears to be the only person in town with any brains, Jane picks up on most of the clues overlooked by the cops and is soon hot on the trail of a murderer. Jane is apt at putting two and two together, hording nuggets of relevant information and generally making a nuisance of herself, and last, but certainly not least, she apparently has a knack for breaking secret codes. The cops are laughably absurd, but they would have to be. It's not just the cops who are laughably absurd, there are several funny incidents including one that borders on farce when in the dark of night, Jane and her brother and sister show up (unbeknownst to each other) to hunt for clues in a small house trailer belonging to a suspect and wind up hooked to a car, haplessly tugged along by a driver who has no idea the trailer is occupied. The odd thing is that everyone in town knows who Jane is and what she's up to (more or less) and yet she continues to get away with it and continues to make George Hammond, the local cop in charge, look like a fool as she almost single-handedly takes over the investigation. He, in turn, is very fond of sitting down at Jane's dinner table and feasting on Teresa's culinary creations so perhaps there is method to his madness. A question: how is a guy with the peculiar name of Jappy Carillo to be taken seriously as a person of Austrian nationality? It occurs to me that the author may not have realized that Carillo is not, necessarily, a Germanic name. But maybe I'm being too picky. At any rate, this is a fine, fun tale to be read (in this instance, re-read) on a crisp Autumn night – I seem to be saying that a lot lately, but this is my favorite reading weather and lately I’ve been reading up a storm. If you look at the Recently Finished books list and/or the books read in 2015 column on the left hand side of my blog, you'll see that I tell no lies. I have been reading up a storm. Lots of good books I hope to be talking about over the next couple of weeks or so. Charlotte Mary Russell (despite the three names) wrote at least 16 books that I'm aware of - see title list at goodreads here - but I've never come across any (besides THE MESSAGE OF THE MUTE DOG). However, I remain hopeful. I'm big on plucky spinster detectives taking care of business. And since this is Friday, don't forget to check in at author Patricia Abbott's blog, Pattinase, to see what other Forgotten (or Overlooked) books other bloggers are talking about today. Well, Stout's middle name was Todhunter ... :) Also, because my parents both hate theirs, my brother and I don;t have middle names - coll and less confusing (except everyone always wonders why not ...). Book sounds great thought Yvette - thanks for that. And look forward to the torrent of reviews coming our way chum :) And by the way, the review I'm posting next Tuesday I am dedicating to you (you'll see why). I don't like my own middle name either, Sergio. :) However I love my daughter's middle name though she never uses it. :) But for authors it all just makes for confusion especially when the names are not mellifluous. Ooooh, can't wait for Tuesday. I've never had a post dedicated to me. Yvette, great review! Would love to get my hands on some,of her books myself.myoumhave been reading up a storm. Thanks, Peggy Ann! Glad you enjoyed it. I love writing this sort of thing. :) I've had great success with Abe Books online for my vintage reading. Send me an address and, if you like, I'll send you on this copy of MESSAGE OF THE MUTE DOG for you to read and maybe pass on to someone else. And single names are even easier to remember, especially when they post such enjoyable reviews as this. Thanks, Mathew. So nice of you to drop by. The mute dog? Is this the dog that didn't bark in the night? Are you sure this takes place in the US? Those characters sound more like they belong in an English village with Miss Marple. Well, I've been reading some heavy stuff lately, so maybe something on the lighter side would be welcome. I'll check around and see what I can find. I'm pretty sure the story takes place in this country, Fred. The dog thing is actually two china dogs that are instrumental in helping solve the crime. I can say no more. This may be too light and humorous for me, but I like the time period. And a new author to try. So I will be looking for this one. Thanks, Yvette. It's not heavy lifting, reading-wise, that's for sure, Tracy. :) But a fun time was had by all and sometimes you just want something like this to wile away the time. I know I do. Never heard of this Author. Thanks for the introduction. Cooks are always in a rush or ticked off mood when in action. Stay out of the kitchen, is a good warning. Better finish getting the yard ready for the snow plows. Yes, I agree. I would probably put up with a cross cook if only I could afford one. Ha. Hoping for more pretty days and less chilly ones coming up. But who knows what sort of winter we will have here in NJ.